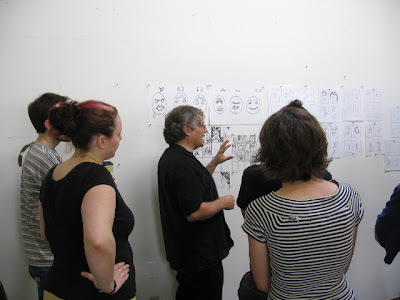 Here I am being instructed and critiqued by Scott McCloud- author of Understanding Comics, Reinventing Comics, and his newest- Making Comics. I was thrilled to find out he would be one of our instructors at PNCA's Graphic Novel Intensive two weeks ago. We were also instructed by Trina Robbins (GoGirl) and Daniel Duford- a local artist doing work in all kinds of mediums. Trina was quite a fantastic character! She had lots of great writing tips and a lot of sass in her frass. She was very encouraging and inspired me to turn Tammytown into a comic. This inspiration grew exponentially after meeting and talking with Mike Richardson, founder of Dark Horse! Mike brought up the very good point that comics allow you greater creative control than film. Less people to collaborate with. He used Joss Whedon as an example, and I squirmed with uncomfortable excitement through all of his tales and insights. Trina Robbins: Writer and Herstorian! I was lucky enough to buy one of Daniel Duford's newest comics, hand letterpressed by him and his wife. It is called The Green Man of B Street and it is becoming an installation piece in the N. Portland transit mall known more as the Green Man of Portland! His comics installation pieces are wonderful, click on his name to have a look-see. Scott was, of course, fantastic! He is currently on a 50-state tour with his whole family. His adorable daughters are making projects of their own along the journey. They seem to be a pretty fantastic family. Also worth a look.